Orval Trappist Ale by Brasserie d'Orval S.A.
Beer #275 is Orval Trappist Ale by Brasserie d’Orval S.A. which is brewed in Belgium in the style of a Belgian Pale Ale with an ABV of 6.9%. Brewed by the Trappist Cistercian monks of Orval, they only brew two beers and one of them is not usually for sale, (they also make cheese) to support their monastery in the Abbaye Notre-Dame d’Orval. This brew poured from the very cool shaped bottle a cloudy amber with a bit of orange to it. The head was magnificent…huge (almost filling up the Duvel tulip glass), fluffy & white. 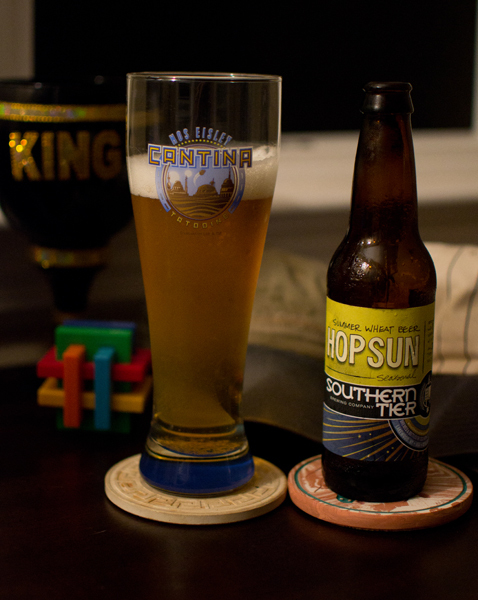 Oh how do I love me some nice head…floating atop a tasty beer. The aroma was quite hoppy…lots of pine filled my nose and was quite yeasty. I also picked up on some apples and pink grapefruit juice. Wow…it wasn’t sweet at all in the taste department, I wasn’t expecting that. It was quite earthy with a nice pine hop thing and a bit of spice like pepper. It had a nice bitterness and finished up very dry. Highly carbonated with a medium body made this quite drinkable for me. No trace of alcohol was noticeable as I was enjoying this. This was an excellent beer that I savored as I sipped it. 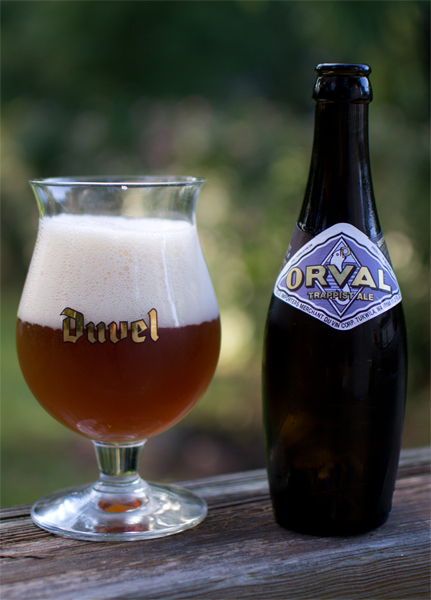 To the Trappist Cistercian monks of Orval…this is some good stuff! Op uw gezondheid!!! I took one last venture out to make sure I have all of the essential supplies I will need for the oncoming hurricane. Ice – check…beer – check…potato chips & onion dip – check, looks like I’m good to go. Beer #272 or today’s jug ‘o beer as I like to call growlers, is Extra Special Bitter Ale by Climax Brewing Company from Roselle Park, New Jersey. Their version of an Extra Special/Strong Bitter Ale has an ABV of 5.5%. The color of this ESB was a nice amber with one finger width off-white head. The nose was interesting, very yeasty smelling and bread like with a citrus (orange) aroma, grass and sweet caramel malts. I thought I may have picked up on grapes in the nose too. 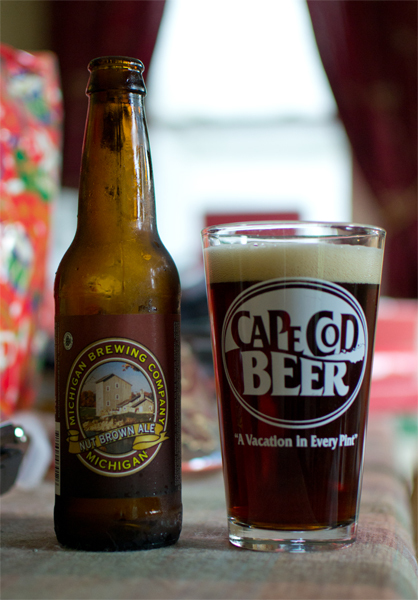 The caramel malts kicked off the taste and about halfway through the hops kick in with a fruity, almost spicy flavor. Odd that the fruit wasn’t citrus but more like grapes that I picked up in the nose. It finished with a toasted bread taste. It had a nice bitterness at the end and finished up a bit dry. There was ample carbonation in this medium bodied brew. This was another really good beer that I will be enjoying for the rest of the afternoon. After all, there is no sense in letting the growler go to waste. 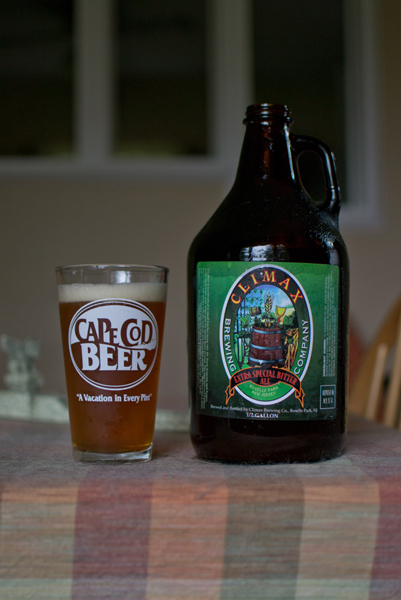 Climax Brewing Company is, in my opinion, one of the best craft brewers in New Jersey. If you happen to be lucky enough to be where they sell their growlers or find their beers on draft…give them a try. As Hurricane Irene approaches, I sit here drinking a beer instead of getting the things I may need…water, batteries for the flashlight, etc. What the heck is wrong with my priorities? Anyways…on to beer #270. 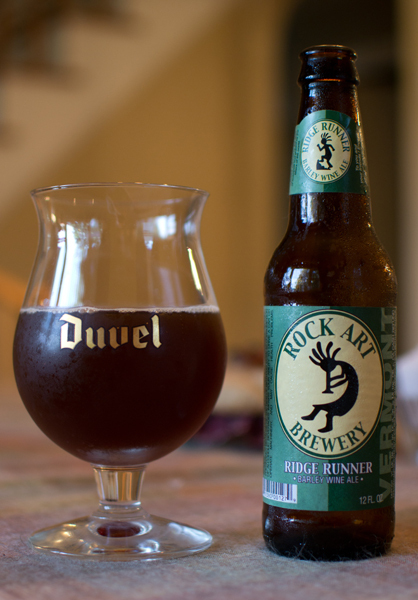 Ridge Runner by Rock Art Brewery is an English Barleywine brewed in Morrisville, Vermont. The ABV comes in at 7.5% . Rock Art uses my favorite “icon”, Kokopelli. I don’t know why I like that little horn playing deity of Native American cultures from the Southwestern United States…I just do. Now to the beer, it poured a dark slightly reddish brown with no head whatsoever. The nose was earthy and smelled like raisins with caramel and brown sugar thrown in for good measure. It was a quite light nose wise for a Barleywine. Lets taste it shall we? I know you can’t taste it…unless you have it on hand that is. The dark fruitiness of the raisins mixes well with the caramel and brown sugar. There is a nice hop kick in there also providing a nice bitter bite. It was not nearly as sweet as some Barleywines I have had and I liked that. It had a slight alcohol kick near the end of it that intensified slightly as it warmed up. It had a medium body and fairly higher amount of stinging carbonation.